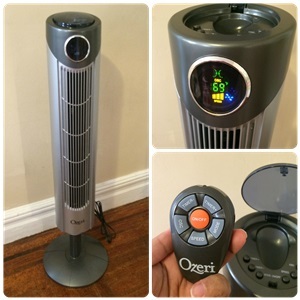 Ozeri Ultra 42-inch Wind Fan Review: All There’s to Know about The Device! I understand guys looking at their wallet every 10 minutes while they’re shopping for stuff. Sometimes, we’re all about saving a bit more for our future. On other occasions, we are in a jar of pickles looking for a way out of a financial mess. In either of the two cases, we don’t want to cut down or comfort level. This is true even when guys shop for an oscillating fan. With so many choices each having a price tag, we often get distracted and end up buying one that we don’t really need. But the review is not “All Praises.” I’m hard on the products I buy as far as their demerits are concerned. So, there’s a bit of scolding at the end. Be sure to check that out too before you buy this fan. This Thing Comes with “Ultra Slim” Tower-Style Design! Don’t roll your eyes backward. Not yet. What you are seeing is true. 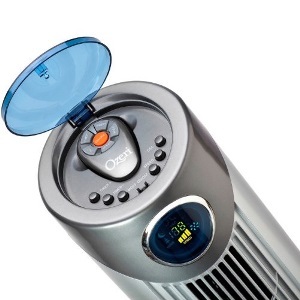 Ozeri manages to pull off an incredible design thanks to the dedicated team. The makers came up with a way to save space. This fan will not eat up space on the sides. Rather, it is tall and slim to make way for other furniture in the room. I’d advise you guys to go for it if you have small-sized rooms to deal with. Everything from the display at the top to the color of the entire fan speaks of quality. This fan won’t trip over unlike a few of them out there. One can thank the incredibly steady stand at the bottom. It is sturdy too! This sleek fan comes with a handle for you to carry it with. The weight is not that much, to be honest. It weighs 12 pounds only. So, you can change positions of this fan without dwindling too much. I won’t lie to you about this. There are wall-mounted fans that take hours to be installed. 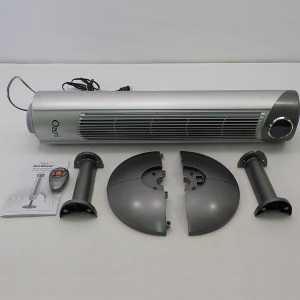 Even window fans take time to be put together. Most of the times, you need an extra pair of hand for the job. But not in the case of Ozeri Ultra 42-inch Wind Fan. The time for the assembly task is lesser than others. One can put the entire thing together on his/her own. There are large nuts and bolts for the job. Everything comes included in the package. You don’t even need extravagant tools for the job. There are optional parts (such as the stand). If you don’t want them to be there, don’t assemble them. Unlike other cheap wind fans, Ozeri comes with well-designed blades. These babies are able to draw more air than normal in the normal setting. As you move higher, the air flow increases. I could tell the difference right away. One can feel the gust of air from ten to twelve feet away. The blades are quiet. You won’t hear the motor making squeaking noises. Rest assured, running the fan for hours won’t damage the motors and in turn, the blades. But, remember to clean them whenever you get the chance. Also, utilize the “Auto Shutoff” feature to the fullest. Cool Control Setup Makes It Easier for People! This fan is not just “Style.” It talks the talk and walks the walk. After the looks, the control panel WILL interest you. You have buttons dedicated to each and every setting. But that’s not all! Even a novice user can cycle through the speed levels without any hitches. One can go through three-speed levels that decide how slow or how fast the air will oscillate around the room. You have an oscillation coverage of 90 degrees. Also, people can enjoy three patterns of airflow too. It makes oscillation even better. Users can choose how they want air to come at them. Frankly speaking, the LED screen is a blessing to have as a part of this product. Especially, when you consider the price to be under 100 dollars. With this LED screen, one can keep track of what’s up with the fan and how each function is behaving at any given time. You have a programmable timer at your disposal. This displays a 12-hour clock that you can program for one hour at a time. It makes the fan shut down after the clock is up. The display shows temperature count among other things. The best thing is, people get a remote control. Yes, even within this price tag. I don’t need to tell my readers that they can do whatever the fan’s controls do with this remote. It has a nice range and fits within the body of the device. The design is uncomplicated; you’ll consume less time while assembling this sleek fan by yourself. Blades of this machine are miracles. Blower wheel and blades drive air while being quiet. I am a fan of the digital readout screen. It shows each and every function in great detail. Did you try the remote control? This little thing has a range to be jealous about. While on the highest setting, the motor is more powerful than you’d imagine. This fan is definitely a bang for your buck. I’m not too fond of the base of this machine. Malleable plastic can cause it to break or tip over. 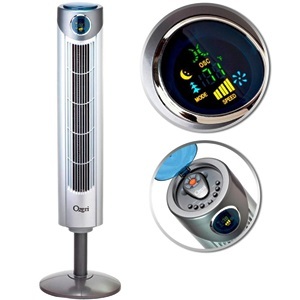 Users will have some degree of difficulty adjusting the height of this Ozeri Wind Fan. The hardest thing for any shopper is the act of compromising between different features. The common trope is that you need to choose between what to have and what not to have in your fans. However, with Ozeri Ultra 42-inch wind fan, this is not a problem. Let’s count the blessings! You have a sleek fan at your disposal and it saves you a lot of space. Then people have three levels of speed to work with. It is super quiet and easy to maintain. I’d have run with it if I were you. If you haven’t yet, buy this thing today. Sure, it has some drawbacks. Yet, for a wind fan under $100, this little machine is quite good. You can’t expect Ozeri to be flawless with such a price tag. I’m happy with what it has to offer.